In the Arts and Expression classes, the theme of the class was “ Painting the Roses Red “. 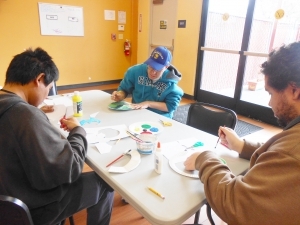 In that class clients were able to flex their creative muscles by making a simple crafts and making it special to them. 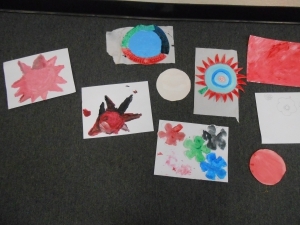 They painted the flowers their favorite colors, and some created special flowers and thoughts of stories about how they grew. Clients were excited to show off their special creations. Staff explained the poem “ Painting the Roses Red” where it talks about looking at the inevitable difficult situation where things die, and people unfortunately pass away, yet we continue to carry on together, making something beautiful out of what we still have left around us. The Community Outing this week we paid a visit to our sister program in Santa Clara County, the awesome AIM HIGHER Sunnyvale! 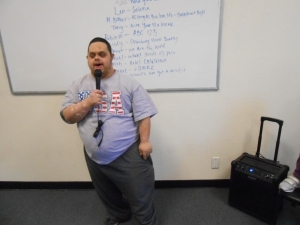 Our clients had a blast hanging out with their peers , they watched a movie, ate lunch , socialized , and made use of some the cool music and computer accessories available. They danced with each other before saying so long, until the next time! In the Functional Education classes, the theme of the class was the “ Luck of the Irish”. The clients learned about the history of St Patrick’s day, and explaining the famous symbols commonly associated with them (i.e. the four leaf clover, Celtic cross and leprechaun’s). Fun facts were injected into the class, to help to capture the client’s interest, as they also enjoyed creating their own famous Irish symbols. 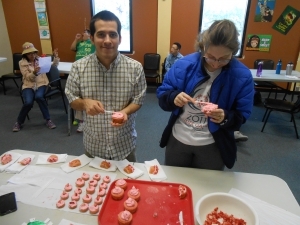 In the Life Skills class our clients made Strawberry cupcakes, with fresh strawberries . They were able to list the ingredients and remember them , so as later when asked without looking at the ingredient sheet , if they got all the components correct, they won an extra cupcake for their efforts!! I love the interaction that I get with the consumers being a Covina Program Instructor. Its great being part of their progression and seeing them achieve their goals! My favorite class is Arts and Craft because you get to see their imaginations run wild. I always encourage them to keep going and not to give up because the possibilities are endless!